What don’t you know me? 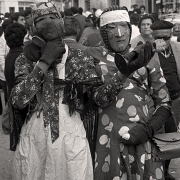 The dictionary of Spanish Language from Spanish Royal Academy defines the Carnival word as a popular festival that precedes Lent and it consists on multiple masquerades, comparsas, dances and other boisterous rejoicing. The origin of Carnival according to the historians could be The Roman festival of Saturnalia in honor of the god Saturn, Lupercalia festival in honor of the greek god Pan or orgies and Bacchanalia which were celebrated in honor of greek god Dyonisus or roman god Bacchus. “To sum up, and to conclude with this annoying noise, I will say very loudly for the whole world to know, that in Miguelturra we have a great time at the Carnival; that there is joy until death, but little desire to work”. 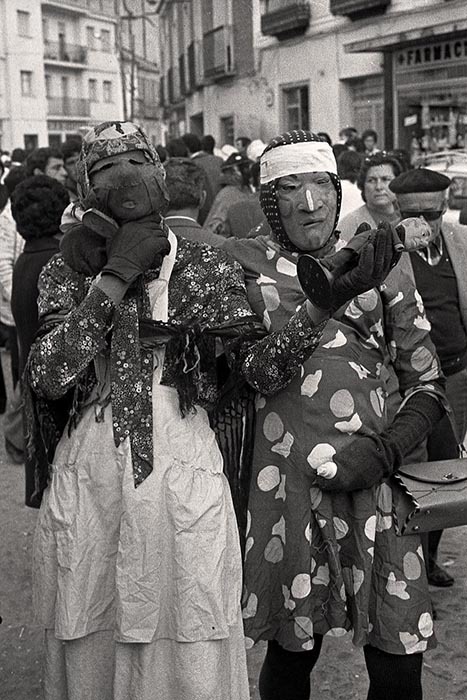 Before Spanish Civil War, Carnival had two different parts the religious and the profane. The religious part enjoyed with the celebrations of Jubilee or Forty Hours’ Devotion, whose cults were composed by masses, adorations, and the exposition of the ‘Blessed Sacrament’ where absolute respect prevailed. The bustle of the carnival was forbidden in the area of the parish and surroundings, where the masks acceded stripped of their disguise. Once Spanish Civil War ended, the religious Carnival gradually declined until its disappearance with the beginning of the democracy. With this type of phrases and similars, the only goal for the Street Mask is to get the bustle, the bewilderment and the laughter of their victims, avoiding to be recognized in order to gloat in them the next days. 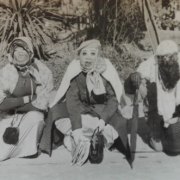 Before the beginning of Spanish Civil War, a character was mingling with street masks, ‘The Alhiguí’. It was a mask that carried a rod or a long reed, in which hung with a string a pepper or a fig. He took advantage of large groups of people to make a stir and throw candies or chestnuts shouting ‘To the Alhigui, to the Alhigui, with the hand not, with the mouth yes’, while children tried to take the fig or the pepper hanging from the stick. This character was becoming less popular until his disappearance, although nowadays he still shows himself occasionally. The ‘murgas’, ‘estudiantinas’ (also known as tunas) and ‘comparsas’, were in charge of giving the spicy and informal touch with their music and songs (well-known as ‘coplillas’). Today we remember them through the contest of Murgas and Chirigotas, while in the street have been replaced by the charangas that give the colorful musical to the party. The comparsas can be seen parading on ‘Piñata Sunday’, the last day of the Carnival. 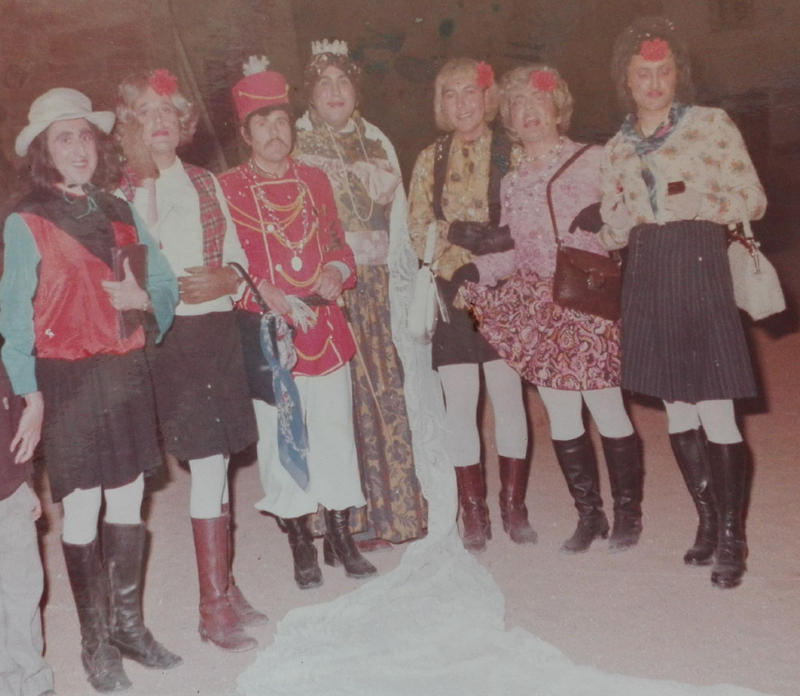 Another event that has evolved and has resisted the changes of times are the dances, which year to year have been transformed into a magnificent event that closes the nights of the churriego carnival. we must say a hooray! so that people become aware. who rules in the Carnival? or is it the Liberal Casino? 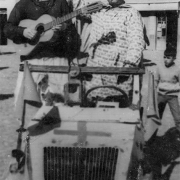 After the Spanish Civil War, the dances appear again, being celebrated in two centers of the town, the ‘Worker Center’ and the Casino which take the place of the abandoned locations of the Syndicate. The entrance to the dances was only allowed to the members of the directive board and people had to take off their masks to prove their identity to any other member. The centers had their private security through ‘El Bastonero’, who ensured have a good decorum and a good behavior. He was provided with a tall rod with colored ribbons and rattles giving warning to those who made some slip. 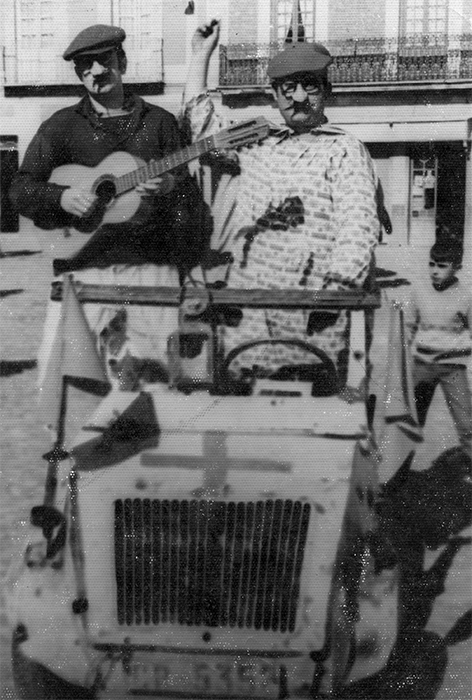 Neither the Spanish Civil War could end with the carnival, although it was very restricted to the neighborhoods, nor less did dictatorships and prohibitions, nor even the time has been able to end with the joy of carnival churriego. 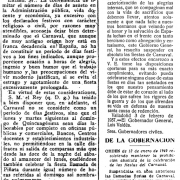 Among other prohibitions that tried to end with the Carnival are the dictatorship of Primo de Rivera and its Royal Circular Order Nº 86 of February 1929, which converted the Carnival holidays into workdays, being limited only to Carnival Sunday and Piñata Sunday and forbidding any Carnival manifestation outside these two Sundays. 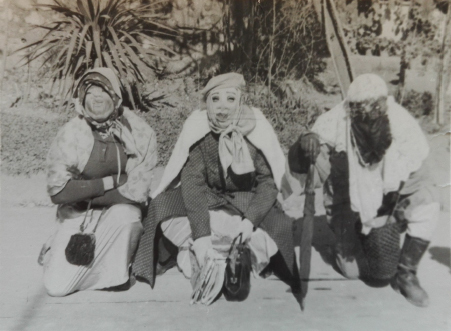 Moreover, on February the 5th of 1937 and in the middle of Spanish Civil War, the suspension of the Carnival in all the country was published in nº 108 of B.O.E. 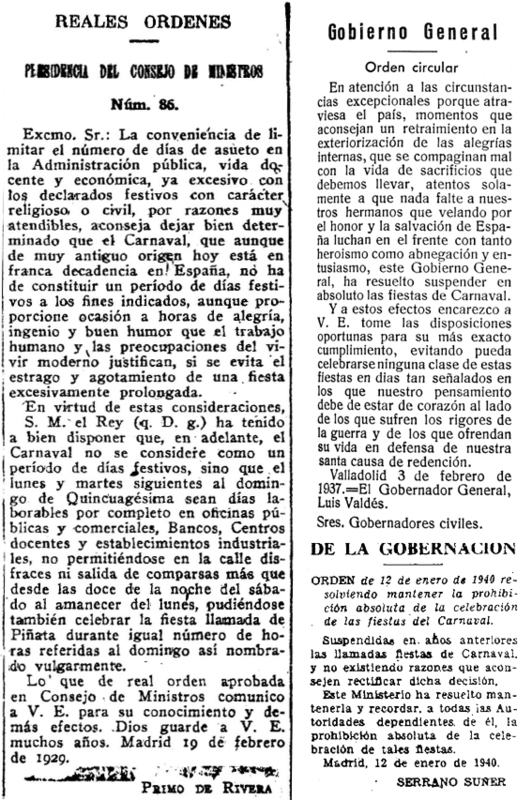 (State official Newsletter) and finally on January the 13th of 1940, on page 277, Mr. Serrano Suñer signs the order to maintain the absolute prohibition of the celebration of the Carnival. This prohibition was maintained until the end of Franco’s dictatorship in 1975. 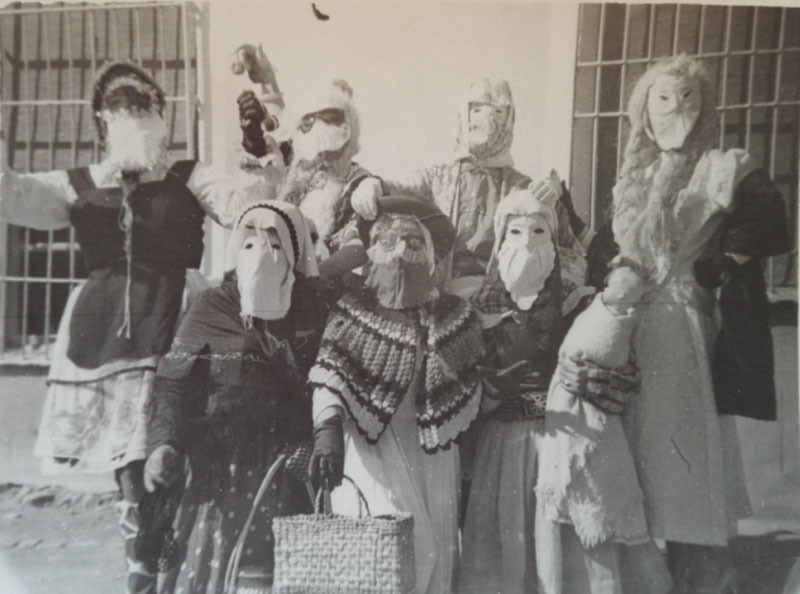 The only thing that got the repressions and prohibitions in our town was civil disobedience, without serious confrontations during this time, except the persecution suffered by the masks from local police (named in this time as ‘serenos’) and the civil guard. 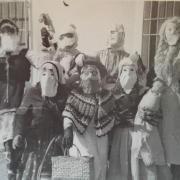 The masks escaped their pursuers through houses whose doors in many cases remained open and facilitated an escape route, jumping walls or climbing to reach the rooftops, all to avoid arrest and fines. The catched masks showed his fine with pride despite of the hurt in his pocket. Mayors, councilors and even some other Civil Governor dared to break the prohibitions that themselves remembered to all year to year. 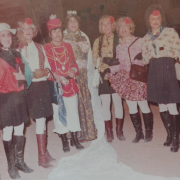 The beginning of democracy and longed for freedom, is the trigger for the expansion of Carnival, not only in Miguelturra, but also in several towns and cities in Spain. 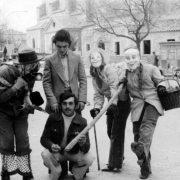 The street masks finally go out to the streets without restrictions, the first carnival social clubs (also known as ‘peñas’) begin to be created and in December 1981 the Cultural Association of Carnival Peñas will be created. ‘Viejas Glorias’, ‘El Jamón’, ‘La Cabra’, ‘La Chambra’, ‘El Sombrero’, ‘Los Segadores’, ‘Barón Amarillo’ y ‘Jóvenes Rebeldes’ are the first followed by ‘Siglo XXI’, ‘Los Pioneros’, ‘El Bufón’, ‘Artesanía Manchega’, ‘La Chistera’, ‘Chotos Impotentes’, ‘Canzoncillos Zurraspaos’, ‘El Betún’, ‘Los Maltrataos’, ‘El Desastre’, ‘Los Sopones’, ‘Los Sofocaos’, ‘Máscaras Mayores’, ‘Charanga Alhiguí’, ‘Los Cansaliebres’, ‘El Puntillo’, ‘Ateneo Cultural’, ‘Los Rocheros’, ‘Kapikua’ and ‘Fregquísimos’. 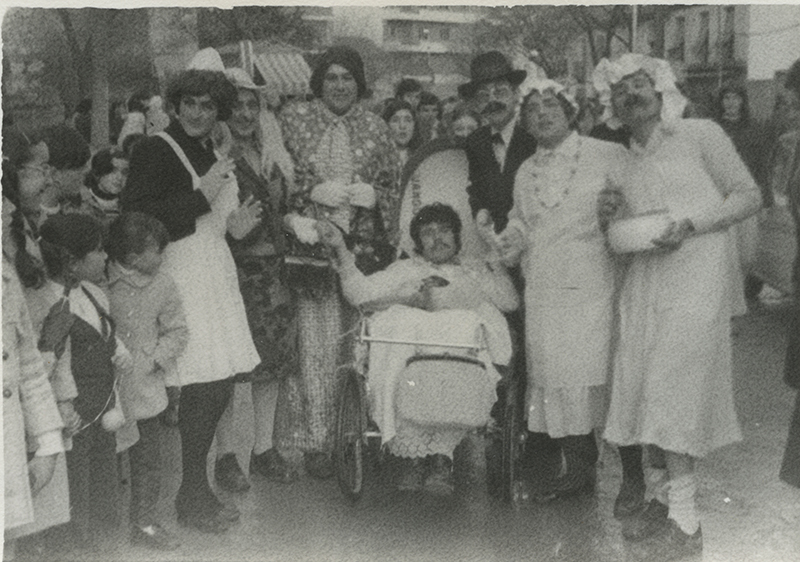 Nowadays the existing Carnival Peñas are: ‘El Jamón’, ‘La Cabra’, ‘El Bufón’, ‘Los Segadores’, ‘Barón Amarillo’, ‘Los Maltrataos’, ‘Máscaras Mayores’, ‘Charanga Alhiguí’, ‘Los Cansaliebres’, ‘El Puntillo’, ‘Ateneo Cultural’, ‘Los Rocheros’, ‘Kapikua’ and ‘Fregquísimos’. 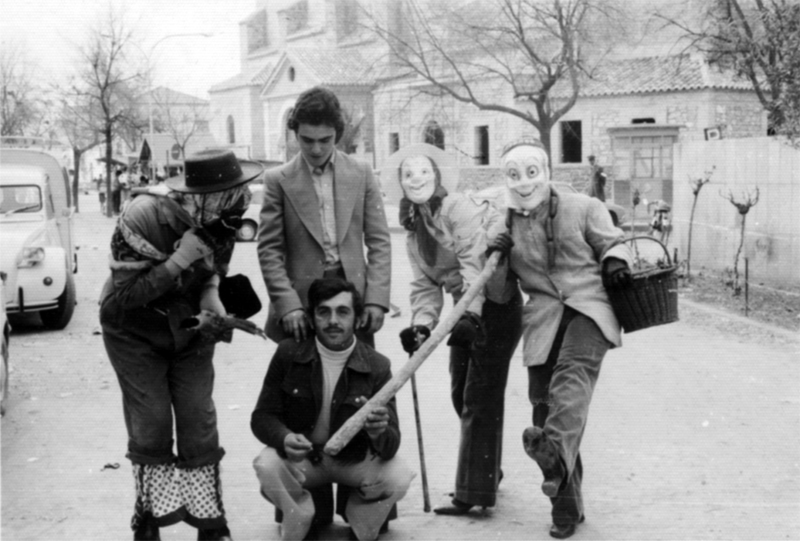 The creation of the Cultural Association of Carnival Peñas, today called “Carnival Association of Miguelturra”, allows the expansion of activities within the ten days which is celebrating churriego carnival, and together with the City Council are organized all acts and contests, promoting the festivity in such a way that on March the 1st of 1983 they are declared as Festivities of Regional Tourist Interest, a year later, on March the 1st of 1984, by the Provincial Council of Ciudad Real as Festivities of Traditional Customs and Cultural Interest. 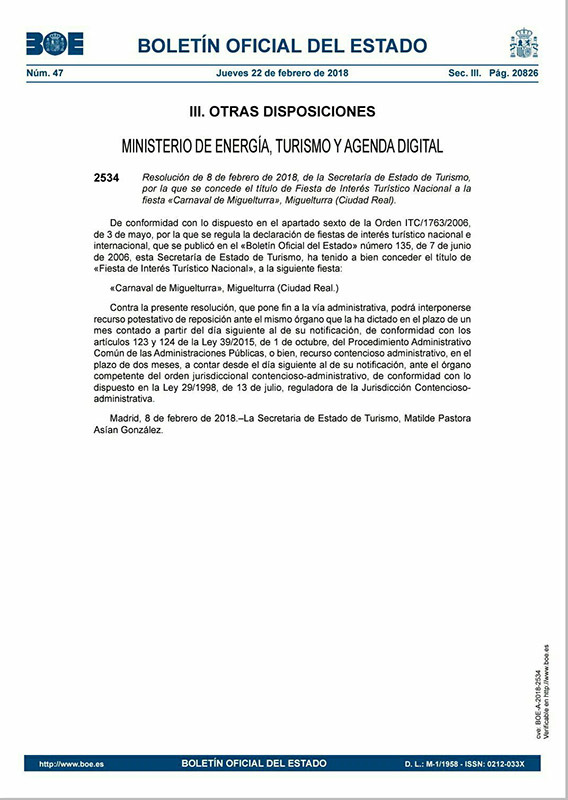 On February 8, 2018, the Secretary of State for Tourism resolves that the Carnival of Miguelturra be declared as a Festival of National Tourist Interest, the BOE No. 47, Sec. III, page 20826 of February 22, 2018, will make said declaration official. Carnival speech, proclamation of Major Masks, Children’s Carnival, the fruit in frying pan, the funeral of the sardine, murgas and chirigotas, Carnival Museum Costumes Contest and the Parade of Comparsas and floats of Piñata Sunday, are the most significant activities that have been celebrated since its creation in the eighties of the twentieth century to the present day. 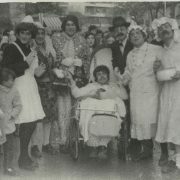 From this website we have developed a thematic section for the characters and events of our carnival, which together with the photo gallery, complement the history of churriego carnival.